We love our 5 coconut oil uses that are so trendy these days. From taming frizz to moisturizing dry skin, this natural ingredient has a wide range of beauty-boosting properties. Talk about natural inexpensive beauty product, that’s right in your cupboard. Heal dry skin, strengthen weak hair and whiten teeth. Create a spa-like experience at home by whipping up this skin-softening treatment that also contains oats, a soothing ingredient ..this oatmeal mask is perfect for dry or sensitive skin. Mix 2 to 3 tablespoons of oats and coconut butter (the solid form of coconut oil) and place it in a reusable muslin bag (you can easily find the bags on amazon.com or etsy.com). Then heat it in the microwave for 30 seconds or until the mixture becomes a thick paste. Add a teaspoon of honey and stir, place mask on face for 5 minutes, then rinse with warm water. Make a spritz with some cool rose water, let skin air dry. 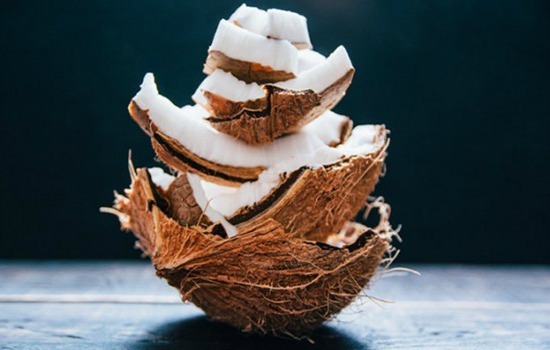 We love the many beauty products that can arise from one beauty product, coconut oil is able to penetrate inside the hair shaft because of its fatty acid structure. If your hair feels dry or is prone to breakage — which may be the case if you use heat tools regularly — try coconut oil as an overnight treatment. Before going to bed, apply virgin coconut oil onto your hair. Rub the oil into the palms of your hands and work your way towards the end of your strands. Follow by brushing with a wide tooth comb, then put your hair in a ponytail or bun and cover it with a shower cap before bed. In the morning, rinse with shampoo and conditioner. Raw organic coconut oil is best to use on hair. Oftentimes it solidifies in the jar, so it’s best to put it in a small microwave-safe bowl for 30 seconds until it liquefies. Let it cool before applying. Is your hair a poufy mess in the summer? Use a small amount of coconut oil in your hair for instant control. Apply a dime size amount onto your fingers and then run it through your hair to put frizz and flyaways in their place. You can also use coconut oil to prevent your hair from frying in the heat. If you’re going to the pool or the beach, it’s best to leave coconut oil in your hair, this creates a barrier between your hair and the drying sun, chlorine, or salt water and keeps it conditioned and healthy. Have you heard of “Oil Pulling” ? …. the newest fade in teeth cleaning — try swishing some oil in your mouth for several minutes a day — may have benefits including whitening your teeth and preventing tooth decay, bleeding gums, and cracked lips. Want to try it yourself? Swish 1 to 2 teaspoons of a vegetable-based oil (coconut, sesame, or olive) in your mouth for 20 minutes, spit it out ,brush around your teeth, rinse with warm water…. perfectly white teeth…and the coconut helps in reducing gum disease. Coconut oil contains antibacterial and antifungal properties, making it the perfect ingredient to use to prevent toenail infections and foot fungus. Try this treatment for cleaner, softer feet before your next pedicure: Pour coconut oil into an empty jar or small bowl until it’s halfway full, then add 2 tablespoons of honey and mix in 1 tablespoon of sugar until the sugar is completely immersed in the oil, then take a couple spoonfuls of the scrub and work into your legs and feet to fully exfoliate, sloughing away dead skin and smoothing out calluses, cracked heels, and rough spots.